There weren't many surprises in the first double gameweek of the season, only that Bobby Reid managed more fantasy points than all but two Manchester City and Everton players. Other than that small detail, everything went as expected, with Tottenham, Man United, Arsenal and Liverpool scoring one goal each. Okay, maybe it was a weird week, but at least everyone captained Sergio Aguero, right? 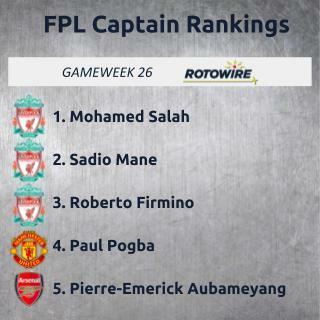 For Gameweek 26, it should be the same situation except with Mohamed Salah the top captain instead of Aguero. Salah hasn't scored in the last two matches, but there's a decent chance Liverpool put a beating on Bournemouth this weekend, not much different from the recent Chelsea-Huddersfield match. The Cherries have had some good results at home, but they've been terrible away, losing their last seven while conceding multiple goals in each match over that span. Even worse, Liverpool have won the last three meetings between these teams by a combined 11-0 score line. That should lead to Salah making the score sheet at least once. If the Reds score three or more, he'd likely make it at least twice. If you want to be different, Sadio Mane has scored in each of the last three matches from seven shots on goal, while Roberto Firmino should get just as many opportunities. If, for some reason, you want to give the armband to a defender, Andrew Robertson may be the best play. Outside of Liverpool, there are some good matchups, though Man United (at Fulham) and Arsenal (at Huddersfield) are both away. Man City could easily score three goals against Chelsea, but there are questions about the starting XI and how Chelsea will perform given their recent results. Spurs would be on the same level as Liverpool, but the goals aren't coming as frequently, even though Son Heung-Min has been a reliable captain choice whenever he's started over the last two months. According to recent numbers, Arsenal probably have the better matchup, as Huddersfield have lost their last six at home while Fulham have at least shown life at home, albeit against lesser competition. And while the Red Devils are winning, they've been a bit shaky in recent matches against Burnley and Leicester. It's close to a toss-up between the studs from each side, with Marcus Rashford and Paul Pogba getting the slight nod from me over Pierre-Emerick Aubameyang and Alexandre Lacazette. The difference is that Rashford and Pogba have produced in every match, and while their schedule has been easier, the win at Tottenham stands out. Rashford continues to score and has at least two shots on goal in his last eight starts, while Pogba has created at least two chances in seven of his last eight while also getting multiple shots on goal in four. Not only have they been more consistent, but Pogba has had higher upside. It's a little different for Aubameyang, who has only scored against Cardiff, Fulham, Brighton and Burnley in the last two months, with one of those matches coming away. Lacazette may be getting as many opportunities as Aubameyang, but he may have the lowest upside of this bunch. The Gunners have played well on the road, but the recent 1-0 loss at West Ham is worrisome. Those three clubs are far above the rest, with Son and City slightly behind in terms of captaincy. Still, Aguero shouldn't be ignored having made the score sheet in seven of his last eight starts. There is a chance that Gabriel Jesus starts, but without the midweek UCL fixture that may not be the case. If you have doubts regarding City's lineup, Raheem Sterling probably makes the most sense for captain after playing only 31 minutes Wednesday. Either way, it's easier to trust the other teams when Chelsea has already shown it can beat Man City. The best differential may be to ride with Wolves, who have scored 10 goals in their last three matches and Newcastle probably won't slow them down. The problem is picking the correct player because their scoring is often varied between Raul Jimenez, Joao Moutinho, Diogo Jota and Ruben Neves. While Jota and Neves are dealing with knocks, Jimenez makes the most sense because he's the top goal scorer, and Moutinho has five assists in the last three matches. Glenn Murray has already shown he can score against weaker competition, and he should get chances against Burnley. You could also say James Ward-Prowse is in the conversation because of form and a matchup against Cardiff, but as with any of these differential options, they aren't as likely to score as the big favorites.